I have always wanted to be a scientist. I was fascinated by the world (and universe) around me when I was young. Planets and dinosaurs were my first obsessions and I had a microscope when I was in grade school. I always expected to be involved in science as a career and I am fortunate enough to be following that path as a PhD student right now. I study the impacts of humans and climate on coral reefs. This isn’t what I originally wanted to do (obviously I wanted to study dolphin and fish behavior, because what marine science nerd didn’t), but I ended up on this path for a variety of reasons. My two biggest motivations behind doing what are do are: 1. find a way to make a tangible difference (ex: make the world better for future generations), and 2. do something you enjoy (ex: don’t hate your job). That’s why I became a scientist and more specifically, that’s why I study coral reefs. Corals reefs are some of the most diverse ecosystems on the planet. They provide shoreline protection from storms, food, and a huge amount of tourism dollars for many countries. They are also a key part of the life cycle of many species of commercially available fish (the fish we eat). However, in spite of their tremendous importance they are on the brink. Coral bleaching is occurring at alarming rates and scales and reefs worldwide are in decline. Over half of the coral cover on Caribbean reefs has been lost in the last 30+ years. Many scientists study Caribbean reefs and I like to think that all of us are doing what we can to understand how and why the reefs are changing. But we have to do more than just understand. We must communicate our knowledge and help apply it to solving or mitigating the problem. We must collaborate with local management groups, NGOs, governments, fisherman, and other stakeholders to make sure that coral reef resources are managed properly so that we can get what we need from them and ensure that they exist for future generations to enjoy and utilize. 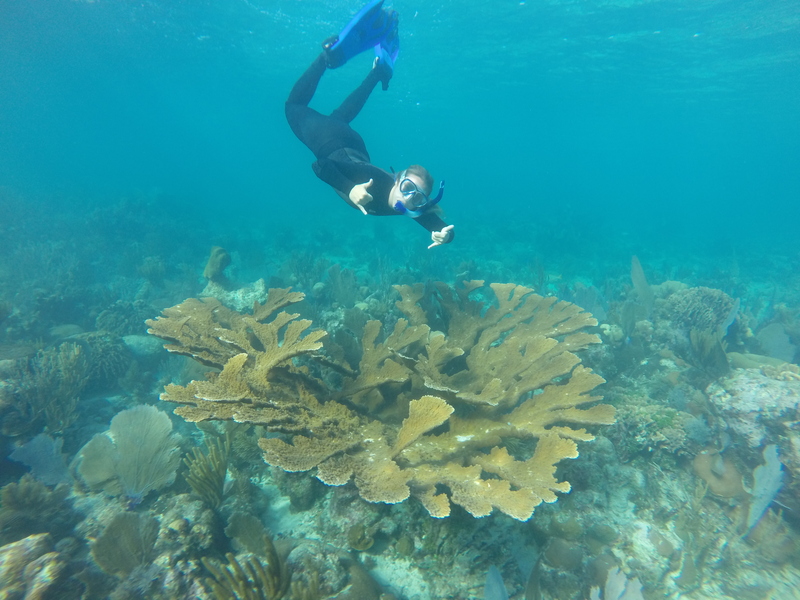 Recently, the Castillo Lab (myself included) spent 2 weeks in Belize collecting coral cores. We will use the cores to determine how stressors like climate change and nutrients have historically impacted the growth of corals across Belize (and the wider Caribbean). For more on the research check out my past blog posts (1, 2). While we were in Belize we established a collaboration with the Toledo Institute for Development and Environment (TIDE), an NGO that manages one of the marine reserves in southern Belize. We presented our recent research findings to the group and fielded questions from many conservationists and mangers. It was a great way to interact with local managers and work toward finding real, tangible solutions to the marine conservation issues that confront NGOs like TIDE. We talked about how to continue or improve nutrient and temperature monitoring programs and why these programs are important. 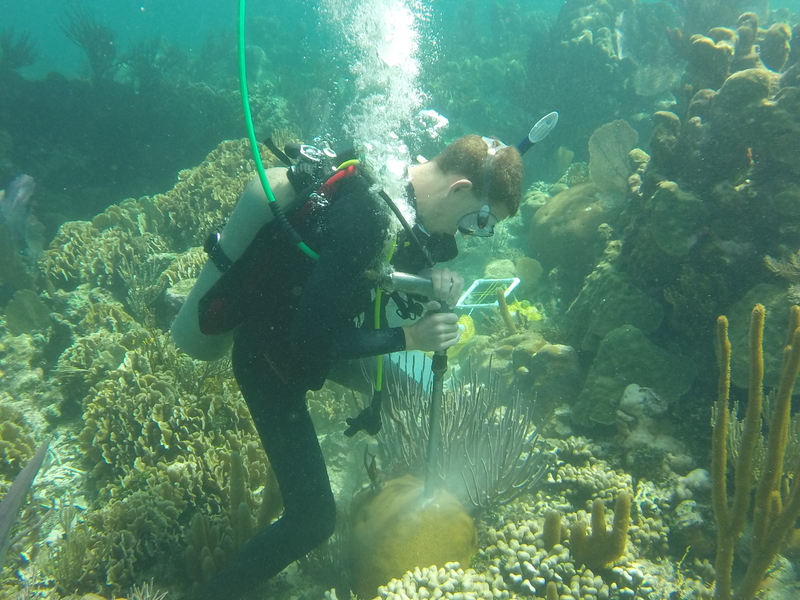 We also discussed the connectivity of reefs across Belize (fellow blogger JP Rippe is examining reef connectivity as part of his graduate work), and how coral growth data can help managers. We especially focused on increasing protection of certain types of coral, particularly near shore. Belize has many beautiful reefs and is home to the second largest continuous fore reef in the world. Belize also has many near shore patch reefs that are small and not as appealing to the eye. 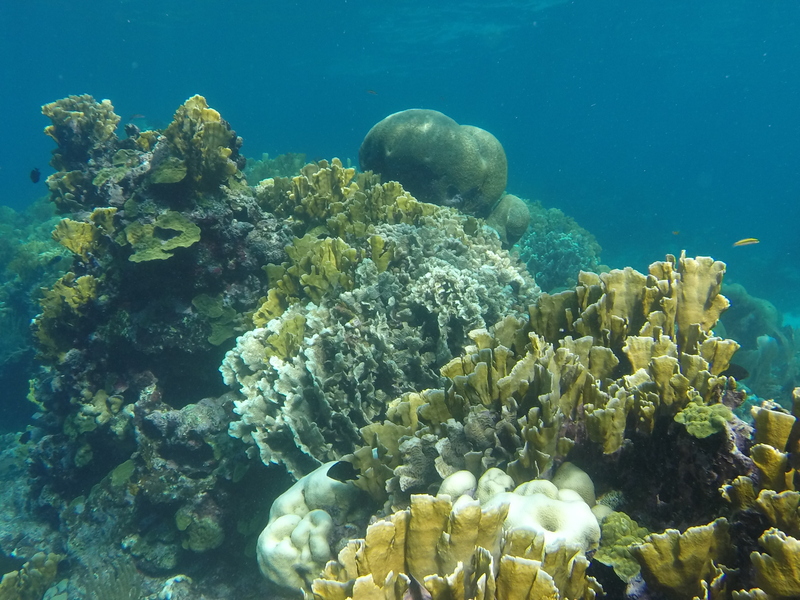 However, these small patch reefs may harbor individual corals that are better suited to warmer temperature, more extreme temperature change, and higher nutrient concentrations- all things that are predicted to occur more frequently under future ocean conditions. To put it simply, these lesser known, less charismatic areas of reef may be more important to protect than the main reef structure. Our presentation and discussion at TIDE focused on this fact and the research coming out of our lab helps to back it up. Having these conversations really helped me refocus on why I started doing this. I want to make change, to make a positive difference and to do that I need other people. I can’t do it alone and neither can you. Collaboration is key (as we learned last month from Shelby). Don’t be afraid to reach out to NGOs or managers. I’m a scientist because I want to make a difference. Why are you a scientist? PS: If you are a citizen interested in getting involved in conservation work contact a local or national NGO or get in touch with scientists at a nearby university or lab. We were fortunate enough to have two very enthusiastic and helpful community researchers join us in Belize! 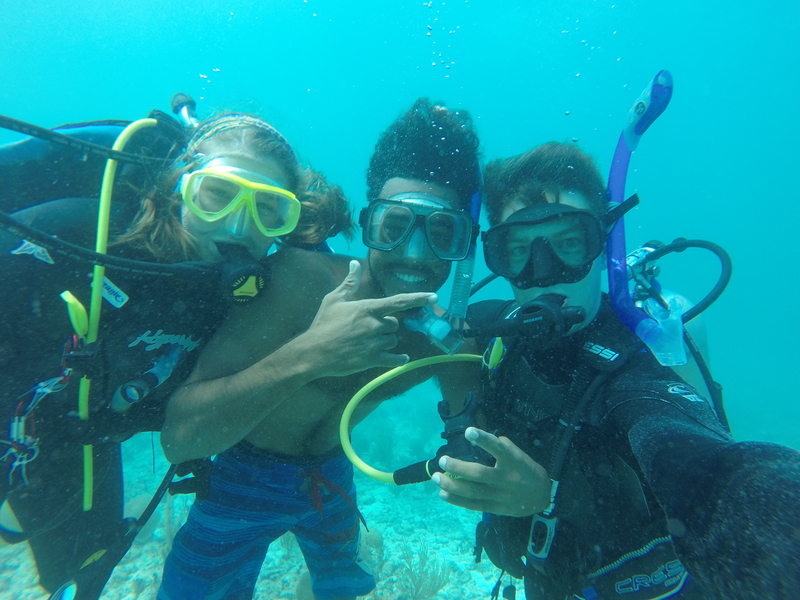 They are experienced divers who want to learn about the reefs and help protect them. It was great to have help and it was also great to learn so much from them (hopefully they learned from us as well). 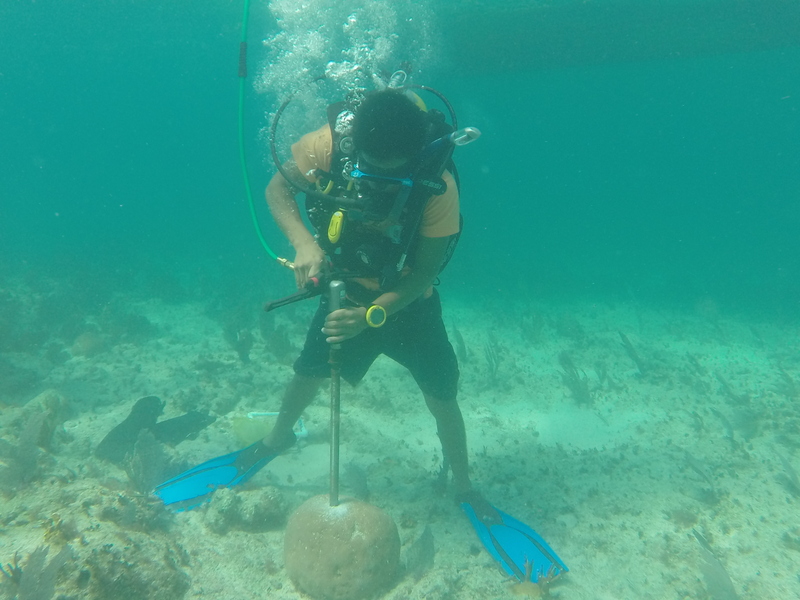 Community researcher Anthony Rash drilling a coral. Tags: Belize, Caribbean, Citizen Science, Climate change, climate science, Conservation, Coral, Coral reef, management, NGO. Bookmark the permalink.